Build with Hydra Core Packages - Enables runtime packages and sets them to the standard vcl and rtl. Also adds Hydra core packages (version specific) to the list. 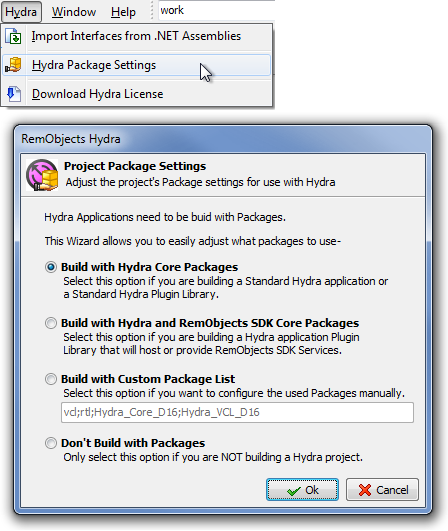 Build with Hydra and RemObjects SDK Core Packages - Same as the first option, but will add a RemObjects SDK core package to the list. Build with Custom Package List - Allows you to manually enter a set of required packages. Don't Build with Packages - Turns runtime package support off. Hydra for FireMonkey doesn't require runtime packages to be able to work properly, so you can use FireMonkey plugin code with VCL code compiled in different versions of Delphi to, for example, extend a Delphi 7 VCL application with new FireMonkey functionality, without porting the entire project to XE2.